2014 has come to a close and it is time to look back and account for what we have accomplished, or didn’t accomplish. What a wonderful opportunity we have to sit down and think about our lives and where we are going. If we don’t like the direction we were going in 2014, then we can change that in 2015. If we aren’t quite as healthy as we want to be, if we didn’t get the promotion we wanted, if we didn’t go on that vacation we’ve been planning, or even if we didn’t spend enough time with those closest to us, 2015 is the year to change all of that. According to a study done by the University of Scranton in 2014, 45% of Americans make New Year’s resolutions. Of those 45%, only 8% are successful in achieving their resolutions. So let's say out of 100 people 45 make resolutions in 2015. Only about 5.6 of those people will achieve their goals. This is starting to sound like a nearly impossible task right? Well, before you are convinced that it is pointless to make resolutions, the study also found that people who are explicit in making their resolutions are 10 times more likely to achieve them. So, the issue isn’t the resolutions, but how we make them. I would like to suggest a few pointers to help our success rate in 2015. Set some quite time aside for you to sit down and really think about what you want to accomplish in 2015. For ideas, think about 2014 and look for things that you would have liked to do or accomplish. Really take some time on this one because if you set goals that you aren’t passionate about you are setting yourself up for failure. Once you come up with some ideas for what you want to achieve, set goals. Make sure your goals are realistic but not too easy, you want to push yourself. Only you can determine what is a realistic goal for you. If you are really struggling ask for some advice from someone who knows you very well. In the end make sure you are the one setting the goal. This way you can’t put the blame on someone else if you fail. This is the most important step. The plan that you create is going to get you from thinking about how great it will be to have a six-pack, to having a great six-pack. Your plan is going to be different for each goal, but make sure you really think this step through. You might need to hop into your time machine and take a trip a few months into the future. Consider what things are going to challenge you a few months down the road and make a plan now to overcome those challenges. For example, if you think in February you will start losing steam, make a plan to get fired up in February. Whatever it takes for you to get fired up, do it. If you are comfortable sharing your resolutions with others, tell them about it and show them your plan. Think of it as your New Year’s resolution sponsor. (If you are trying to sober up or stop smoking, a sponsor and a 12 step program is an excellent way to do it) Find someone close to you that you can check in with and make sure you are on the right path. I have a feeling that 2015 is going to be a great year. Just to get your blood pumping and to get you excited for the new year, here is the speech that Herb Brooks gave to the 1980 U.S. Hockey team before they beat the Russian hockey team. This speech always gets me pumped up! Trevor Hansen is the finance manager at Your Employment Solutions. 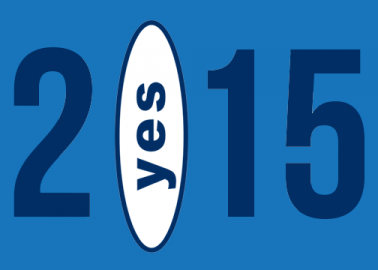 Celebrating 20 Years of YES!